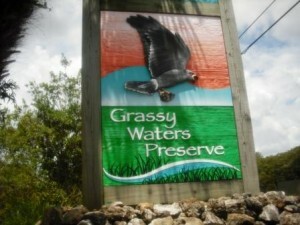 The following trails are part of Grassy Waters Preserve which is a 23 square mile wetlands ecosystem that also serves as freshwater supply for the City of West Palm Beach. 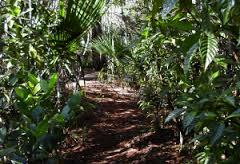 Trails vary in length and difficulty levels and are accessible to the public free of charge. Remember to come prepared with drinking water, sunscreen, hat, sunglasses and insect repellant especially during hot summer months. You can sign up for canoeing excursions and specialty hikes with staff guides. From I-95 at Okeechobee Blvd, West Palm Beach, drive west for 4.6 miles to Jog Road. From Florida’s Turnpike, exit at Okeechobee Blvd and drive west 0.9 mile to Jog Road. Turn north off Okeechobee Blvd and watch for the park entrance on the left, just as the road starts a curve to the right, at 3125 N Jog Road. This is a bike trail with crushed concrete with intermittent boardwalks. Combination of restored and natural wetland including cabbage palm hammock, mesic pine flatwoods, forested wetlands and cypress domes. Here you can see snail kite, red hawk, osprey, otter, bobcat, feral hog, oak toad, wild turkey, white-tailed deer and coyote. Restrooms and water at parking area with Chickee-huts along the trail. Nature Center sits on the south side of Northlake Blvd. and offers guided canoe tours by staff guides only. Boardwalk is accessible to both wheelchairs and strollers. Chickee huts and benches provided along the boardwalk. Restrooms and water fountains in parking area. 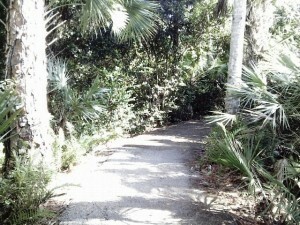 Short 0.5 mile hiking trail adjacent to the Gator Lake canoe launch. Narrow trail of sand and exposed limestone loops around Gator Lake, through wet prairie bordered by cypress. You can spot bobcat, otter, snail kite, woodpecker and wild turkey. Fishing pier 225 feet from trailhead. Restrooms and water in parking area which is located at 8537 Northlake Blvd, west of I-95. Hiking and biking trails. Restrooms available. Trail head is at dead end of 45th Street near Jog Road. 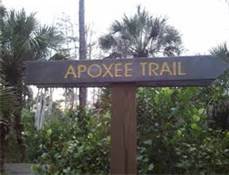 Excellent trail for viewing all kinds of wildlife, wading birds, alligators, bobcats and deer. The trail connect with both the Apoxee Trail and the SWA trails. Entrance and parking on the west of Jog Road, one mile north of Okeechobee Blvd. 2.5 miles hiking trail, great for viewing wildlife. A short paved ADA trail branches off into a natural substrate trail consisting of sand and boardwalks. The trail winds through restored wetland hammock and pine flatwoods. Heavy rain can cause trail flooding so be aware you may encounter muddy conditions along the way. Best to use this trail when conditions are mostly dry. Butterfly Orchid Trail which loops around back to the parking lot. It’s a short 0.5 mile easy walk for most anyone. Wildlife Viewing: Great horned owls, bobcat, white tailed deer, raccoon, armadillo, possum, and other wetland dependent species. Located in the parking at SWA building at 7501 N Jog Road or the Palmetto Trailhead lot at 45th St and Jog Road. 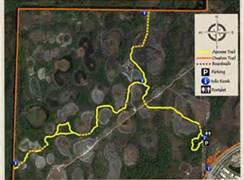 These trails explore the Solid Waste Authority’s conservation area and connect directly to the Owahee Trail. Trails consist of crushed concrete with intermittent boardwalks. A large wading bird rookery flourishes amidst the wetlands and pine flatwoods. You can spot wading birds including the wood stork, roseate spoonbills, tri-colored herons, pileated woodpeckers and ibis. Chickee-Huts along the trail.